Turkish town in the vilayet of Adana, 12 miles from the Mediterranean, on the River Cydnus. During the Roman period it was the capital of Cilicia. It was important on account of its commerce and its textile products, and was famed for its schools of rhetoric. In Tarsus, as in Cilicia generally, the original population was Semitic, a fact reflected in the tradition that the city was a Phenician colony (Dio Chrysostom, "Orationes," xxxiii. 40), while on Phenician coins it was often called "Taraz" ( ). Josephus ("Ant." i. 6, § 1), in agreement with rabbinical literature (Gen. R. xxxvii. 1; Yer. Meg. 71b; Targ. Yer. to Gen. x. 4), identified the city with Tarshish (Gen. x. 4), and accordingly believed it was to Tarsus that Jonah wished to flee ("Ant." ix. 10, § 2). A monument to Jonah was discovered in Tarsus in 1876; but it doubtless dates from the Christian period. The Hellenization of the city began in the days of Alexander the Great; this influence was fully felt by the Jews, who had been colonized at Tarsus bythe Seleucids about 170 B.C. During the reign of Antiochus Epiphanes a revolt of these colonists proved a factor in Jewish history (II Macc. iv. 30-38). Nothing further is known regarding the Jews of this city, although it later became famous as the birthplace of Saul of Tarsus, who lived there for a time (Acts ix. 11, xi. 25, xxi. 39, xxii. 3) and claimed Roman citizenship in virtue thereof. Ramsay, followed by Schürer, has proved (see Hastings, "Dict. Bible," ii. 105, s.v. 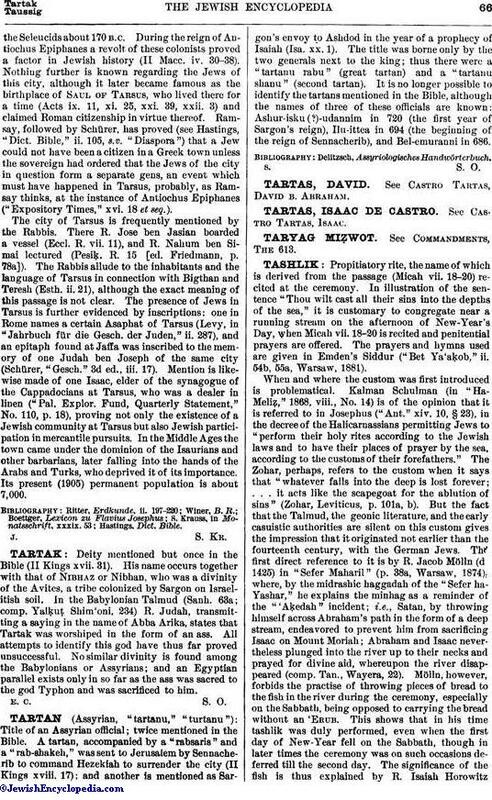 "Diaspora") that a Jew could not have been a citizen in a Greek town unless the sovereign had ordered that the Jews of the city in question form a separate gens, an event which must have happened in Tarsus, probably, as Ramsay thinks, at the instance of Antiochus Epiphanes ("Expository Times," xvi. 18 et seq.). 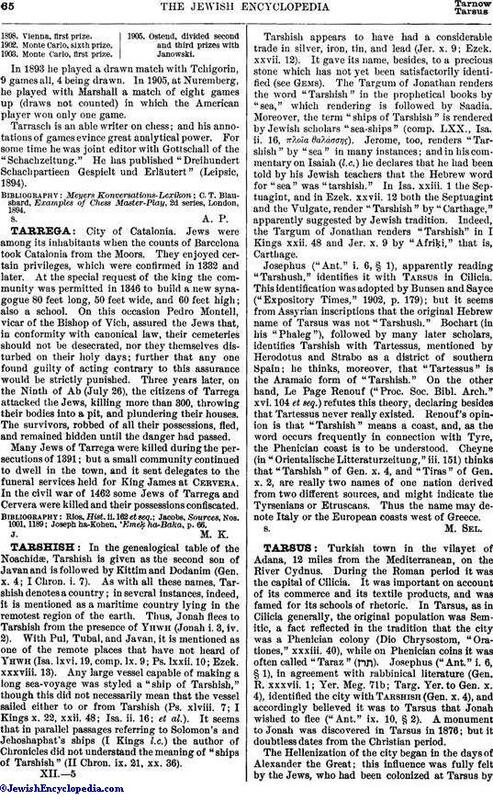 The city of Tarsus is frequently mentioned by the Rabbis. There R. Jose ben Jasian boarded a vessel (Eccl. R. vii. 11), and R. Nahum ben Simai lectured (Pesiḳ. R. 15 [ed. Friedmann, p. 78a]). The Rabbis allude to the inhabitants and the language of Tarsus in connection with Bigthan and Teresh (Esth. ii. 21), although the exact meaning of this passage is not clear. The presence of Jews in Tarsus is further evidenced by inscriptions: one in Rome names a certain Asaphat of Tarsus (Levy, in "Jahrbuch für die Gesch. der Juden," ii. 287), and an epitaph found at Jaffa was inscribed to the memory of one Judah ben Joseph of the same city (Schürer, "Gesch." 3d ed., iii. 17). Mention is likewise made of one Isaac, elder of the synagogue of the Cappadocians at Tarsus, who was a dealer in linen ("Pal. Explor. Fund, Quarterly Statement," No. 110, p. 18), proving not only the existence of a Jewish community at Tarsus but also Jewish participation in mercantile pursuits. In the Middle Ages the town came under the dominion of the Isaurians and other barbarians, later falling into the hands of the Arabs and Turks, who deprived it of its importance. Its present (1905) permanent population is about 7,000.